Best Friends Animal Society As a rescue dog himself, office pet Owen is passionate about Gumball Poodle's donation of NKUT socks to support No Kill Utah (an organization dedicated to making Utah a no kill shelter state). Owen looks petrified performing quality control on new socks for No Kill Utah - an initiative of Best Friends Animal Society. Gumball Poodle is proud to support Best Friends Animal Society and their No Kill initiatives NKLA and NKUT. The No Kill organizations are working to eliminate the killing of healthy and treatable dogs and cats in shelters in LA (by 2017) and in Utah (by 2019). The initiatives provide more spay/neuter services, as well as push adoptions to find happy and healthy homes for pets. If you would like to help support this awesome cause, you can purchase NKLA, NKUT or Best Friends Animal Society socks directly through Best Friends Animal Society. They are now available via mail order from their shop at their sanctuary in Kanab, UT. 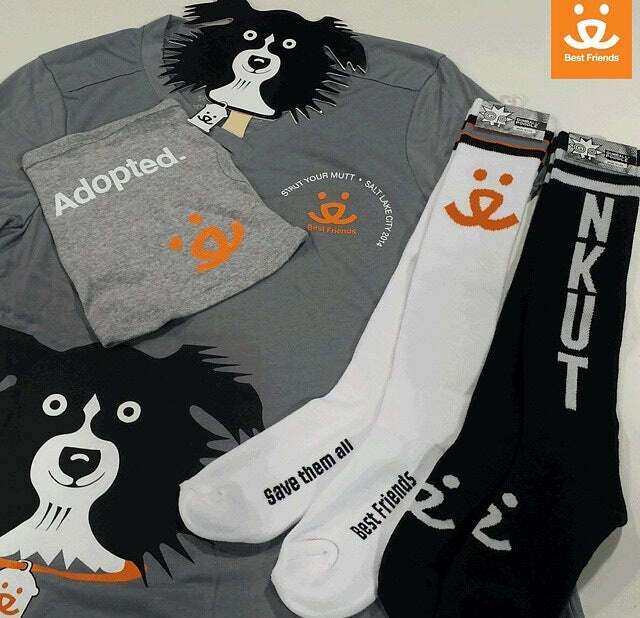 Please email giftshop@bestfriends.org with any questions regarding sock purchases. 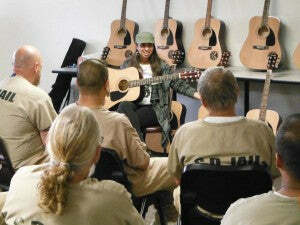 LA Youth Network is another way we like give back. Local support is close to our heart, and LAYN focuses on helping homeless teens in Los Angeles get their lives on track. The organization provides counseling, training, shelter, clothes and other services to youth in need. Gumball Poodle has donated nearly 1,000 pairs of new socks to LAYN in the past 12 months. 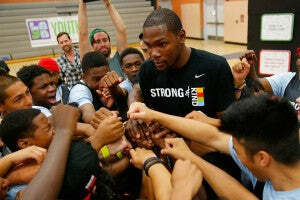 Kevin Durant's visit during an LAYN event at Helen Bernstein High School.